RIA Money Transfer is the third largest money transfer service in the world. It operates over 350,000 cash pick up locations worldwide, and even features a door-to-door courier service in some countries. You can choose to send money via bank account, credit card, debit card, or cash transfer. Credit and debit card transactions are the fastest but can be the costliest while bank account transfers take up to 4 days yet are more affordable. You can send as much as $2,999 online on any given day and $7,999 over a 30 day period via RIA Money Transfer. By visiting a local agent in person, you may be able to send more than the lower limit. How Much Does RIA Money Transfer Cost? Which Countries Can You Send Money To Via RIA Money Transfer? How Fast Can RIA Money Transfer Send Money? In 2007, RIA Money Transfer was acquired by Euronet Worldwide, the largest independent network provider of ATMs in India. At last count, Euronet processed over 2.3 billion transactions daily. As a leading provider of money transfers, you might expect RIA Money Transfer to be a low cost provider, and for the most part you would be right, as long as you don’t send money via credit card or debit card. During our research, fees on credit card transfers ranged from 4% → 14%+ depending on the country selected and the amount sent. When sending money via credit card, you may also pay a cash advance fee to your credit card company as well as higher interest rate charges than normal for regular purchases. Sending money via bank transfer is the cheaper and better choice if you are not in a rush. When you choose to send money through your bank account or debit card, the cost can be as much as 4% of the total amount sent from our research. In addition to the fees charged by remittance companies to send money, a spread markup is usually applied too. This means that the exchange rate quoted online is not the rate you will receive because a markup is added. The markups protect remittance companies from taking on exchange rate risk when money is transferred to a different currency. To limit the risk of losing money from currency swings, RIA Money Transfer charges a markup that spans a wide range from less than 1% when sending money to India to as much as 10% when sending money to China. It should be emphasized that these markup costs are applied by most remittance companies and it is not unusual for RIA Money Transfer to impose them too. Nevertheless if you plan to send money frequently, these costs can add up in a hurry so it is well worth examining precisely how much the markup cost will be before sending money. Send Money To Via RIA Money Transfer? RIA Money Transfers lets you send money to 149 countries and features 350,000 locations worldwide. Almost every major region in the world is supported, including Asia, Europe, Americas, Pacific, and Middle East. However, not all countries have Send Locations. For example, you can both send money from and receive money to Belgium, Australia, New Zealand, and many other countries but most African countries have Receive Locations only, but not Send Locations. RIA Money Transfer saves you the inconvenience of standing in line at an agent location when you wish to send money abroad. However, it doesn’t restrict that method of transfer either. If you prefer an in-person experience, you can visit any of the 350,000 agents scattered around the globe. To send cash, you will need to visit an agent in person, however the simplest way to send money is online via the web or on your phone if you have an iOS or Android device. You can do so via bank transfer, debit card, or credit card. On the other end, cash pick-up is available for recipients at local banks as well as supermarkets in some countries. A home delivery service where money is couriered to the recipient’s address is provided in Armenia, the Dominican Republic, Hungary, Morocco, Nicaragua, Peru, the Philippines, and Vietnam. 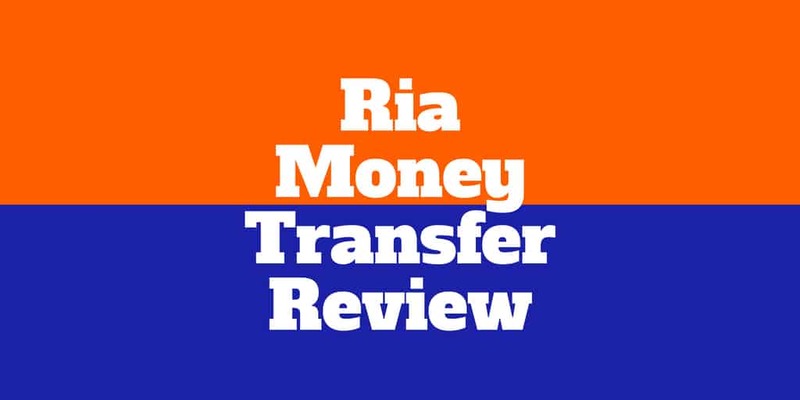 RIA Money Transfers wins points for being fast, simple, and intuitive. Simply select the country where you are sending money. Enter the amount you wish to send. You will then be shown the amount of money that will be received at the other end. Choose your delivery method, whether bank deposit or cash pickup. And pick the method of payment, whether bank transfer, debit card, or credit card. Don’t forget that bank transfers are going to be your least costly option but it will take as long as 4 days for funds to arrive versus just minutes using a credit or debit card. Finally, you will be asked to enter the recipient’s details, including name, phone number, email, and street address. After you submit the money transfer, RIA will keep you up to-date about where your money is at each step of the process. And to alleviate concerns, RIA Money Transfer guarantees your money will be received or refunded to you. Generally bank transfers take around 4 days because small deposits are needed to verify accounts before money is sent. Credit card transfers and debit card transfers take place in minutes. ✅ Same-day Delivery: Money transfers to most countries are available on the same day. ❌ Maximum Amount: The maximum amount you can send daily or over 30 days is lower than some other remittance companies. ✅ Payment Methods: You can send money via bank transfer (cheapest method), cash, debit card, or credit card (most expensive). ❌ Credit/Debit Card Fees: Credit card fees can be very high especially when added to the fees that may be tacked on by your credit card issuer. ✅ Mobile & Website Compatible: RIA Money Transfer supports money transfers online, as well as via iOS, and Android devices. ❌ Exchange Markup: A spread markup cost of as much as 10% may be applied to online money transfers to China or as much as 3% to other locations. ✅ Delivery Options: Bank deposits and cash pick-ups are supported at agent locations as well as retail stores and even supermarkets in some countries. ✅ High Transfer Limits: The daily limit starts out at $2,999 while the 30 day limit is $7,999. ✅ 149 Countries: Large global network, featuring over 149 supported countries. ✅ Trusted Remittance Company: RIA Money Transfer has been in business since 1987 and is backed by Euronet Worldwide, a company that operates the largest independent network of ATMs in India. ✅ No Minimum Send: Unlike some other money transfer services, RIA Money Transfer imposes no minimum amount restrictions. When you need to send money abroad fast, RIA Money Transfer is a solid choice. Depending on the payment method, delivery option, and destination you choose, it can take as little as a few minutes for money to get into the hands of recipients. You can send as much as $2,999 at one time online or as much as $7,999 over a 30 day period. If you need to send more, it is best to visit an agent in person. From start to finish, the process of sending money is fast and intuitive. But speed doesn’t always mean cheap. Credit card transactions may be the fastest method of money transfer but are also the most expensive choice. Bank transfers take up to 4 days but are a much cheaper option if you are not in a rush to get money to your loved ones. Pay attention to spread markup costs on currency exchange rates if you plan to send money frequently as they can add up to a big chunk of change over time. What you do receive with RIA Money Transfer is the confidence that your money is in good hands with one of the largest remittance services in the world that has decades of experience, and guarantees the safety of your funds. The bottom line is RIA Money Transfer may not be the lowest cost provider but if you need to get money to family, friends, or loved ones in a hurry, it has earned a reputation and a trusted provider. ‹ What Are The 7 Best Personal Finance Books?